A day out to the seaside. The weather wasn’t too bad when we woke up this morning. In fact for once it wasn’t raining, and the promised storm hadn’t yet arrived. So in our wisdom, and with a certain sense of adventure the decision was made to have a little trip to the sea side. I was even promised an ice cream if I was a good boy. Enough said! An ice cream! I couldn’t pass up a promise like that now could I? So once all the wet weather gear had been donned. Hats and gloves dug out of the drawers, and a flask of hot water for some coffee, we were ready to brave the elements. 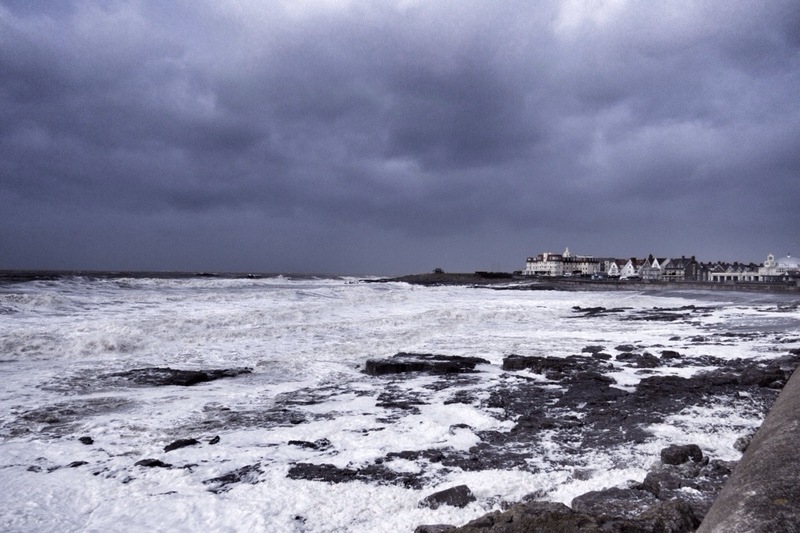 Even in the short time it took to drive to Porthcawl the wind had got up, and the sky was looking very threatening. My main worry was that a threatening sky would induce the boss to say “its much too cold for an ice cream!”. I began to fret. Porthcawl is a small town on the South Wales Coast between Cardiff to the east and Swansea to the west. In the 19th century is was developed into a coal port, but quickly lost out to larger and more accessible ports to the east at Barry and Cardiff. The long beaches with sand and rock pools didn’t go to waste, as the South Wales coal miners flocked to the town. However, like so many other resorts that boomed in the Victorian and early 20th century then lost out as visitors abandoned it in favour of guaranteed sun abroad. The blurb on Porthcawl’s official website boasts that “if Elvis lived in Wales, he would live in Porthcawl”. Well if he had any sense he would have moved to his winter house on a day like today. 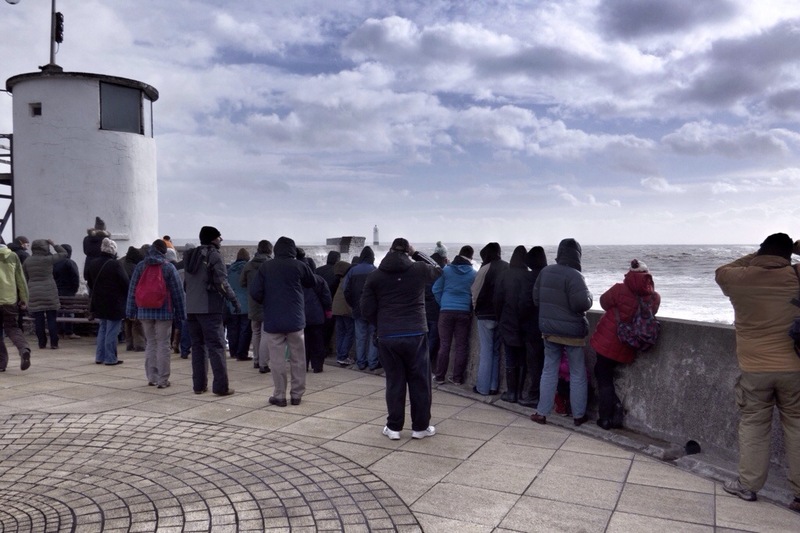 Even as we drove along the road to the sea front we could see that it was busy with visitors – though as it was pointed out to me they were probably not here for the ice cream. Have I mentioned I like ice cream. 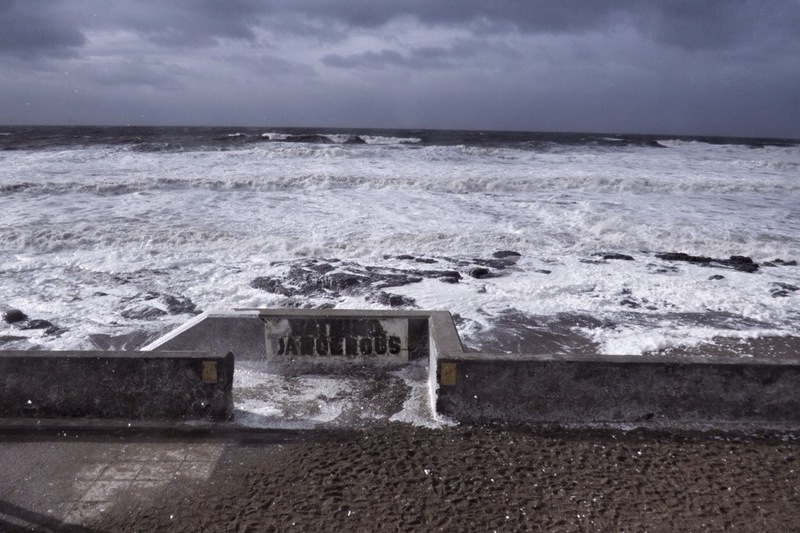 As we came round the corner we could see the waves crashing over the sea wall driven by the wind. As we struggled out of the car the wind blasted into our faces. And the cold stole the feeling from our fingers. 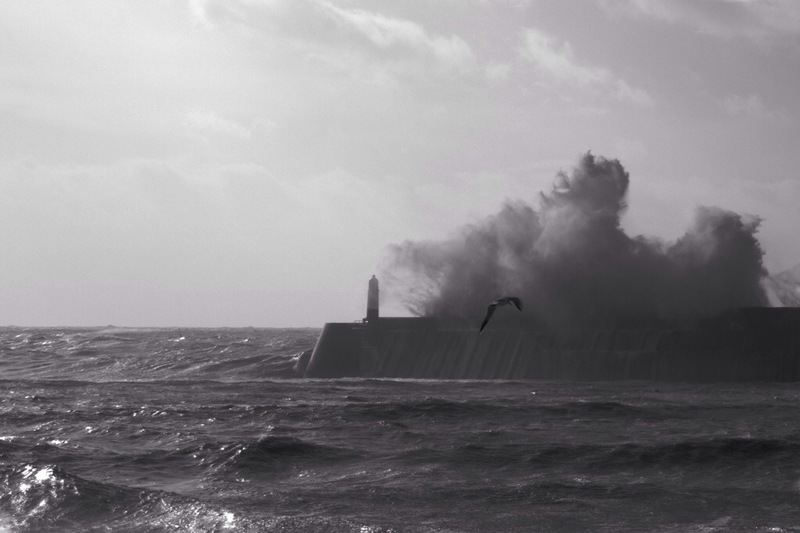 The views from the sea front were spectacular as The waves battered against he sea wall time and time again. 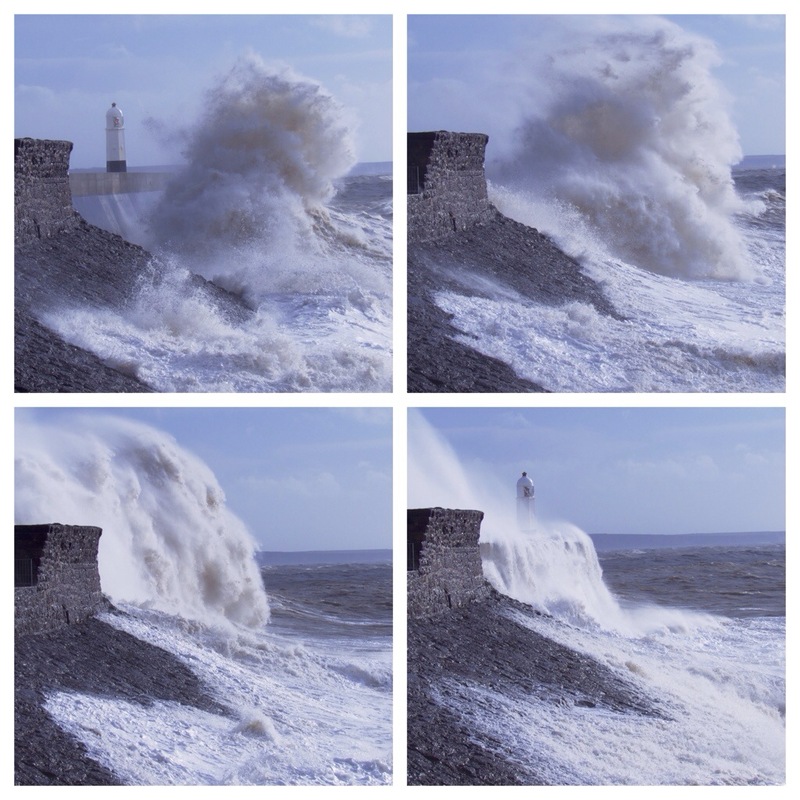 The thunderous waves beat mercilessly against the Victorian harbour walls, exploding into the air enveloping the small light house. Almost as if the sea was determined to wash it off the wall and into the harbour behind. The bay in front of there town was full of white water as wave after wave came thundering in to crash on the limestone rocks lining the sea front. For those intrepid souls who might have been thinking that a bracing dip in the sea would do them some good, the local council have helpfully painted a warning on the sea wall, pointing out that “bathing is dangerous”. I am sure this helpful advice is the sola reason for the fact that we didn’t see anyone swimming. And did I get my ice cream after all that? Simply …. No. But I was allowed a coffee and was frowned at as I suggested that some caramel shortcake would be just the thing on such a nasty day. Oh well! What about Elvis? There was no sign of him. He must have been on his holidays in the sun. Maybe next time. Lovely photos. looking forward to The S.African blog.